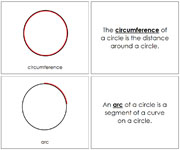 Fundamental concepts of geometry 3-part cards. Describes 4 fundamental concepts of geometry. 3-Part cards for 13 complex polygon concepts. 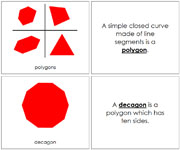 Describes 13 polygons - complex concepts. 14 Parts of a circle in 3-part cards. Describes 14 parts of a circle. 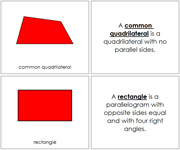 8 Parts of a parallelogram in 3-part cards. Describes 8 parts of a parallelogram. 16 Parts of a polygon in 3-part cards. Describes 16 parts of a polygon.